Walking along the panorama path up to the Diemlachkogel, seven points of „dulcet vistas“ can be found. They will be transformed to impressive panorama terraces. Existing topographical „hot spots“, like the „Mitterkopperl“ and the „Schüttkegel“, will be integrated in the string of pearl focussing the best panorama of the area. 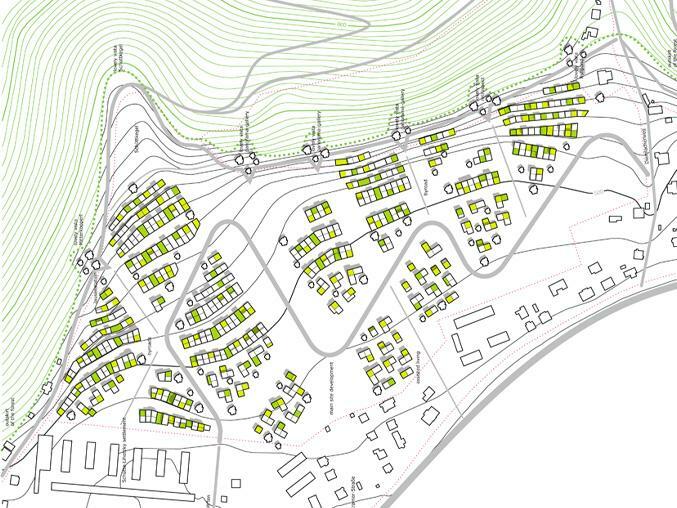 The seven vistas, Mountain chains and in particular the two landmark mountains (Dürrnberg and Emberg) with their closely impression on the site generate with their corresponding views the grid of the masterplan. Filtered and extracted visual lines configure the rhomb grid. 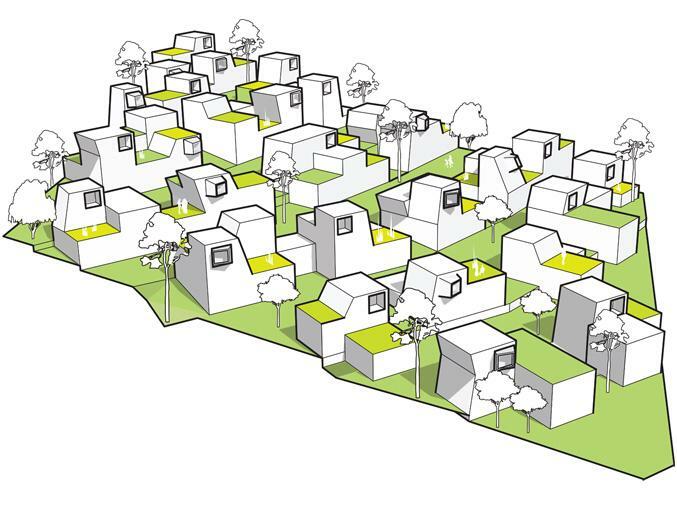 The tree populated housing fields are situated between the grid layer. The green passages are remaining as open, grassy stripes. The topographical basin of the Mürztal and the shielded area of the insulated site in reverse side of the mountain Diemlachkogel will necessitate an intensive air convection in form of green air lanes. In particular , winterdays are often extremly calm. The green axes will stimulate the crosswise aeration, the air convection downwards the hill will be warranted. Cool, fresh air from the mountain woods can still circulate in the evening down towards the river Mürz. At noontime, wenn the slope is heating-up, warm air can flow uphill towards the forest. The cross-linked concept of open spaces will avoid congestions in wide-ranging aeration. A+B+C: Structure and Density - 3 Types of Housing Zones The curved planning site will be analyzed by the formation of its elevation an then sperated in gradient zones. With the analyse of the level curves in interaction with the building lots- evoked from the grid- three zones are generated: a smooth, medium and a forceful gradient zone. The three zones (A,B,C) are cropped, according to the topography, with three housing types (1,2,3). 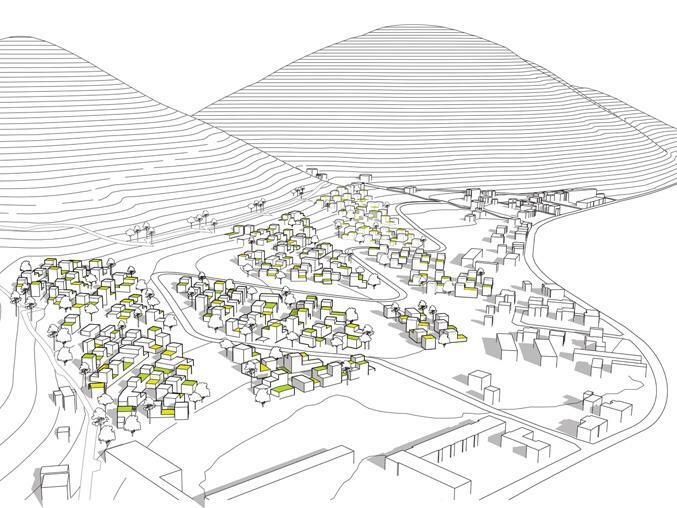 The contour of the building line is deduced from the swinging formation of the hillside, the groups of houses accent the slope in his existing form. 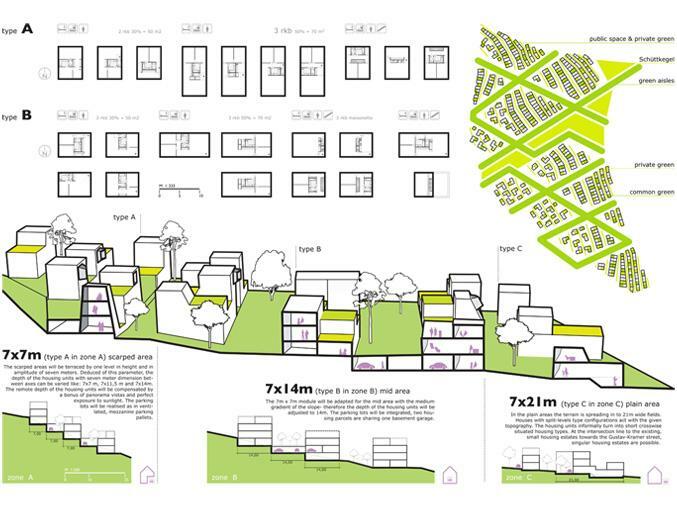 Public space and private green Public spaces are situated in the green aisles, they connect the single housing lots and are multifunctional usable. Private places inside the lots are, in contrast, bitsy and of different forms. Each flat will sustain a privat lot outdoors- like roof terraces, gazebos or at-grade decks. The panorama vistas towards the mountain range are the parameter for the location of the private green.